With everyone and everything going green these days, isn’t it time that business cards began to follow the trend? Paper business cards present a lot more issues than people are willing to admit. It’s easy to forget your cards when you are headed to an event or meeting, and it’s hard to find specific cards them when you’re shuffling through a huge stack from the last conference you attended. Like others who have entered this space in various ways, like 5Degrees, Dropcard (now defunct), CloudContact and CardMunch, uME makes it much easier to manage business cards. This free iPhone app lets you create and store digital business cards so you can have all your networking connections right at your fingertips. uME digital business cards presents many key advantages over paper cards. Instead of having to carry cards around with you all the time, all you need is your phone. 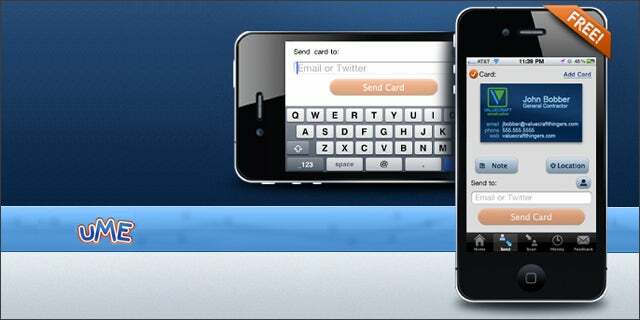 The app allows you to create multiple cards and send as many of them as you want to whomever you want for free, even to people who don’t have the app, and you can connect your business card to your social networks. When you receive a business card from someone else, the card and all its contents are directly imported to uME. Orient yourself with the new world of networking and download the uME app and let us know what you think. It’s currently only on the iPhone App Store but is coming soon to the Android market, so watch out for it, Droid owners.